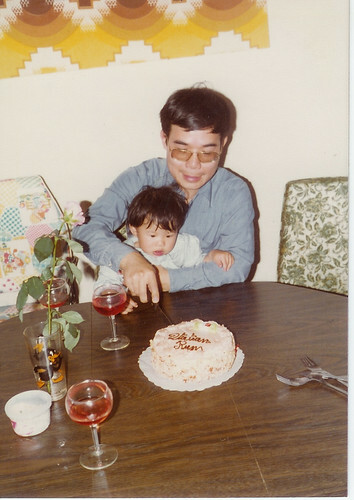 Thinking of Dad… 4 years after his passing…, originally uploaded by @jozjozjoz. I had intended to stop by and visit my Dad’s ashes this afternoon, but due to a series of wild goose chases, and the day generally getting away from me, that didn’t happen. I can’t believe another year has gone by and with the success of V3con 2013 behind me, I’ve been hunkered down and laying low for the last few weeks. It was nice to venture out today, get some errands done and especially to have a tiny baby in my arms all afternoon. This past year has been pretty mind-blowing from a family perspective… not for me personally, so much as for my brother, whose own family life went into fast-forward. If he’d made it to this year, my Dad would have become a proud new grandfather and seen the joy of our family expanding by one. In almost every way, the new baby really has been a bundle of joy, and it was the first time in years that I didn’t spend the bulk of late June being completely sad, because what’s there to be sad about when there’s a new baby to be happy about, right? I think it’s only when it’s quiet and when I think about all the “unshared” precious moments that Dad isn’t here for (in person) that I get sad. But I’ve come to really believe that my Dad’s spirit has been watching over our family and that despite not being here physically, his spirit is always close. It’s both comforting and bittersweet. Thanks to my sister-in-law for allowing me to spend the afternoon being Auntie Joz and not having to worry about much else today. Since I’d been sick/busy/tired/busy/etc for weeks on end, I really haven’t had time to spend with the baby, so today was really the first day that I could. I waited for my brother to get home for work before leaving and he said he was surprised that I hadn’t updated my blog about my Dad, because he knows that I do this every year. Of course, I said I was planning to before the day is out. I couldn’t help but to see glimpses of my proud Dad in my brother as he held his first child– what I see in my own father’s face in snapshots of him holding me when I was a baby. So even though I didn’t make it to visit my Dad’s ashes, I know my Dad would have preferred that I spend time with the people I love. If he was here, I know he would want to spend every opportunity with his grandchild and so I need to remember that babies grow so quickly and I need to appreciate every opportunity I have to be Auntie Joz, especially since Dad’s not able to feel the joy of holding the baby in his arms. What a lovely post, Joz. It’s a beautiful thing to see life in the sadness of loss. I feel like I get to know your dad better every time I read and hear about him through you. Any man who has sported a Chinese perm is a great man in my opinion. Love to you and your fam!